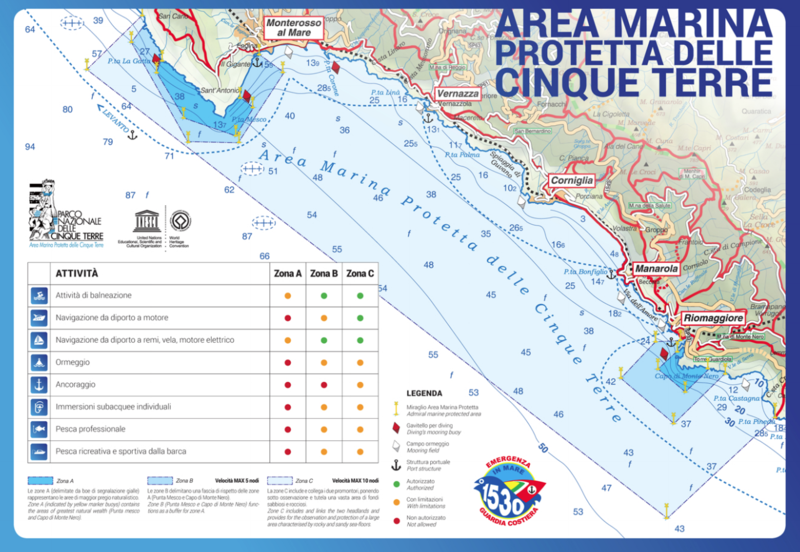 The Cinque Terre Marine Protected Area was established with a decree of the Ministry of Environment of December 12th, 1997, and it includes the municipalities of Riomaggiore, Vernazza, Monterosso and a small part of Levanto. The establishment of the Marine Protected Areas is provided by two national laws: Regulations for the safeguard of the sea (no. 979 of December 31st, 1982) and Framework Law on Protected Areas (no. 394 of December 6th, 1991). The purpose of the Cinque Terre Marine Protected Area, which includes two A-Zones of integral natural reserve and 2 B-Zones of general natural reserve in Punta Mesco and Capo Montenero, and is also proud of an extraordinary variety and abundance of animal and plant species, is to protect and enhance the natural, chemical and physical characteristics and the marine as well as coastal biodiversity, also and especially through environmental recovery measures, with the collaboration of the academic and scientific world. For these reasons, study, monitoring and scientific research programs are constantly realized in the fields of natural science and environmental safeguard, with the aim to assure the systematic knowing of the area, but also to foster an environmental sustainable development, paying particular attention to the enhancement of the traditional activities, of the local cultures, of the eco-friendly tourism and to the use of the socially sensitive categories. In the last years both the National Park and the Marine Protected Area of the Cinque Terre, that have become members of the Cetaceans' Sanctuary since 1999, have launched a series of projects with several Italian and European protected areas.